Noah's Ark: Truth or Legend? Regardless, it sure is a fun subject to illustrate! Child 1: My mom's having a new baby. Child 2: Whats wrong with the old one? 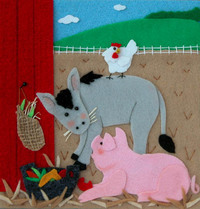 Here is the felt version of the illustration I posted last week. Okay, you choose. 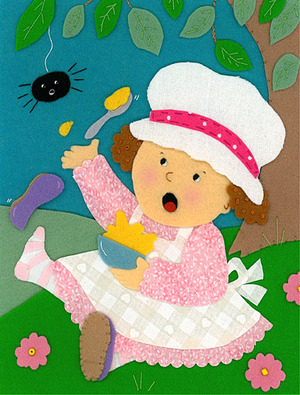 Who is more scared, Miss Muffet or the spider? I know...bit of a stretch on the theme but there you go. Here is the finished piece from the sketch I shared last week. It also works well for this weeks I.F. theme, "Tales and Legends". Here's more on the legend of the mermaid. I couldn't resist participating this week. 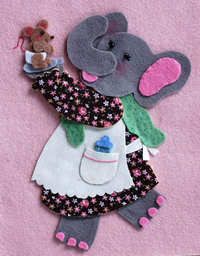 This is a commissioned piece I did for a wonderful little girl's bedroom. This weeks Illustration Friday topic is "portrait". Here is a self portrait I did when I signed on with my rep recently. I think from now on I'll stick to using animals for my self portrait because this look has already changed! I now have blond hair and no glasses. Yep! I went this week and got blond highlights and about 3 inches chopped off. It's hot here, I had to do something! The spotted puppy saves the day! I'm coming in kind of late with my illo friday contribution. 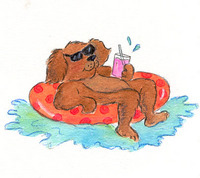 (not even going to bother posting it to illo friday site) But I thought this little guy would be appropriate. "Slow and steady wins the race", as they say. "Speed" is something I'm always battling. I try to rush and do too much and in the end make myself physically ill and burned out. I want to slow down and enjoy the process, y'know? Savor the journey regarding all aspects of my life. Really, that's what it's all about isn't it? Enjoying the here and now because who knows what tomorrow will bring. On the homefront we have been dealing with the shock that a dearly loved family member has been diagnosed with an aggressive , incurable cancer. We're all having a difficult time grasping and accepting the situation. It has only been three years since my husbands mom lost her battle with cancer and now it's his dads turn. Here is a picture of my lovely father in law, "pops" with his new bride ,Ms. Sue. She has been such a blessing for all of us. We would appreciate prayers if you feel a prompting to do so. As my friend snowbear would say.. 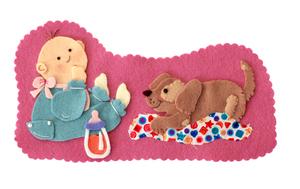 This piece has recently retired from the ol' portfolio but I think I'd like to redo it at some point with a better quality felt. Well, there she is again, batting her eye lashes trying to invade your thoughts. Miss Prissy, Little Pain In The Bottom, Green Eyed Monster. 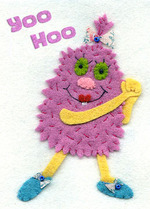 She can be a pesky monster that likes to mess with your self esteem, make you question your talent and direction. She even has a clever knack of skewing reality and reeking havoc on your state of mind. Don't let her do it to you. Tell her to be on her merry way and bother someone else because you have better things to do than spend time with her! We've all been there and it's something we're not proud of admitting. But let's face it , this field gives one ample opportunities to get a little green. 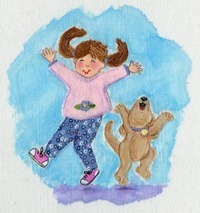 I'm a freelance children's book illustrator because ....I want to illustrate children's books. When one of my ever so talented friends gets that "dream assignment" or achieves the goal that I have set for myself yet haven't quite reached...sure it affects me. But you know what? I don't think "envy" is really the appropriate label for this feeling. I think we're simply experiencing, yearning. A yearning because we too want to be a success at what what we do. So how do I handle Miss Prissy, Little Pain In The Bottom,Green Eyed Monster? 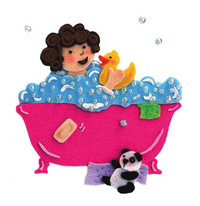 *Well, first I take a soak in a hot bath and sulk. *Then,I try to remind myself that we all have a purpose in this world and since I truly feel like this career is where I belong...then the opportunities will come...when it's time. *And then I try to focus on what I have achieved so far and count my blessings because there are many. *Then I scold myself for a few minutes when I realize that I should be more grateful and stop comparing myself to others. *And finally, I work on a plan. What can I work on next? What can I do today to get one step closer towards my goal? Yes, Miss Prissy ,Little Pain In The Bottom ,Green Eyed Monster I see you there batting your eyelashes at me. Go on now,scoot,I have work to do. Remember when you were little and it was so exciting to see how much you had grown in a year? I love tea, hot and cold! Here is an illustration I did for "Hopscotch Magazine". 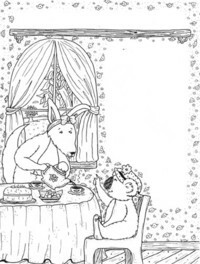 It accompanied a poem called, "The Picky Eater" about a kangaroo who invites his friend over for tea. Unfortunately the koala would have preferred a bit of eucalyptus instead. 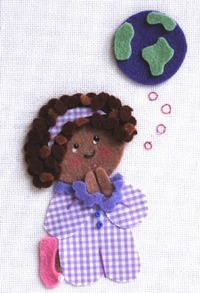 I've been thinking about redoing this with felt. May play with that soon. I found another quote, "don't step in a fresh turd on a hot day." Lucky for you , I didn't have an illustration to go along with it! 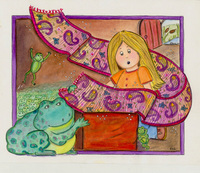 This weeks Illo Friday theme is "escape". Here is a pet show gone awry. I did this illustration a while back for a promotional postcard mailing. With everything that has been going on with the aftermath of Hurricane Katrina, I was so happy to find this quote. We all want to make a difference and help during this time of tragedy. Through our monetary donations or gifts of our time, we can. It's so exciting when we have a dream, isn't it? A vision of something that we want to accomplish that keeps us up at night just thinking about all the possibilities! Then... the hard part comes, working our dream into a reality. GROAN. It may take weeks, months or even years to reach our goals and often along the way we will encounter discouragement and uncertainty. One of the most self-sabotaging things we can do is compare ourselves to others. I have been guilty of this myself and if you want to set yourself off course, well by golly, that's a guaranteed way to do it! Don't go there. When you see others doing well in an area that you are pursuing, celebrate their accomplishments! One day it will be you. I truly believe that there is a great plan for all of us. More importantly, everyone's journey is unique and often we have to keep our blinders on and stay true to our own path. Timing is everything. I'm sorry, I'm not trying to "pollyanna" you to death with this post! But I do feel I can talk from experience. 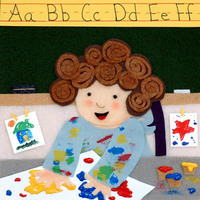 I have been illustrating professionally for nearly 6 years. If I look at it day by day , I've accomplished my goals at a snails pace. But what is important is that I HAVE accomplished goals and achieved things I never would have dreamed starting out! And the same will be true for you once you start stepping out in faith and putting that extra effort towards your goal. Yes, you will experience rejection. Yes, you will hit roadblocks and detours. But I can tell you with complete certainty that if you embrace the set backs, they will lead you in directions you may not have even considered otherwise. 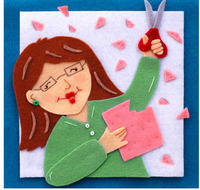 Here's a good article by fellow illustrator , Amy Moreno. She sat down and reevaluated her goals and shared them this week on her blog. 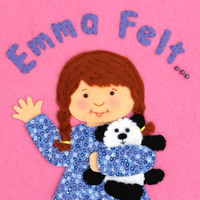 *To have Emma Felt published and in the hands of toddler girls everywhere. 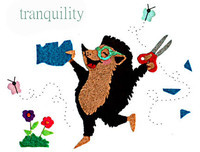 *To have a series of "Felt" books. 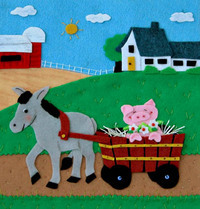 *To be illustrating numerous toddler books in my felt collage style. Okay...time to get to work on making that a reality! 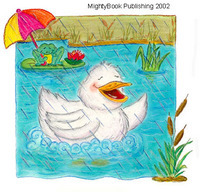 As soon as I saw this weeks illo-friday prompt, "reflection", I was reminded of a dummy-book that I worked on several years ago. It was during Susan Hartungs Illustration Course and I decided to create a dummy around Robert Louis Stevenson's poem, "The Little Land". You know what...I may have to revisit this dummy. I think it just might have some potential! Seek the wisdom of the ages, but look at the world through the eyes of a child." We must view young people not as empty bottles to be filled but as candles to be lit. All is right with the world when I really get in to a piece I'm working on. This little guy is gazing at the stars after a fun filled day of playing football. Actually this is a portion of a portfolio reject. He's actually looking at a moon wearing a nightcap but the moon is awwwwful. It's a shame when you finish a piece and it doesn't come out the way you had hoped, isn't it? 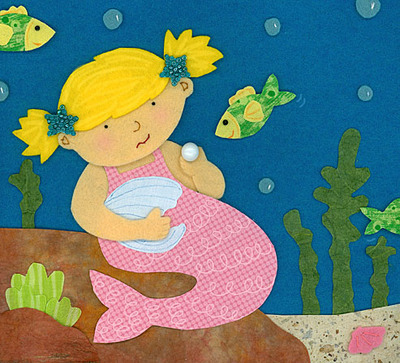 This weeks Illustration Friday theme is "aquatic". 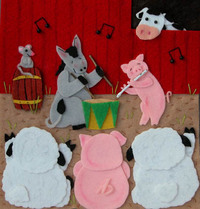 This is an illustration from an internet song book "barnyard babies" that I did some time ago. I may take this one and redo it in felt one day to see how it turns out! I'm way behind with this. It's a very rough idea sketch for my next felt piece which will be going along with a poem I've written. I Plan on submitting it to magazine publishers when it's finished. I'll show it to you when it's done. Oh, I love this quote. I have relied heavily on persistence and determination to help me move forward in children's publishing. I have seen some very talented illustrators (and authors) give up way too soon and it saddens me. This is a tough business but it IS possible if we don't give up. 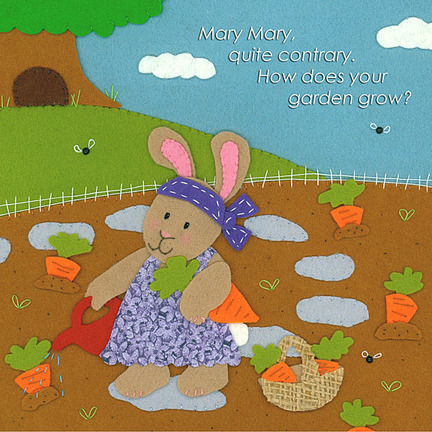 The illustration above is one that I did quite some years ago as an assignment for the Susan Hartung illustration course I took. 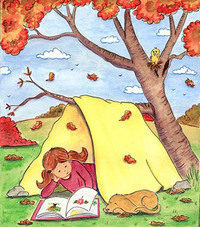 One of my favorite activities as a child was spending time "alone" reading. Funny, we don't change very much as we age, do we? 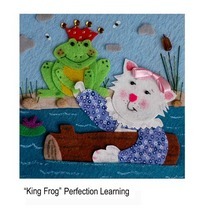 Another image from "Luke & Duke" published by Perfection Learning. Illustration Friday theme is "travel" this week. 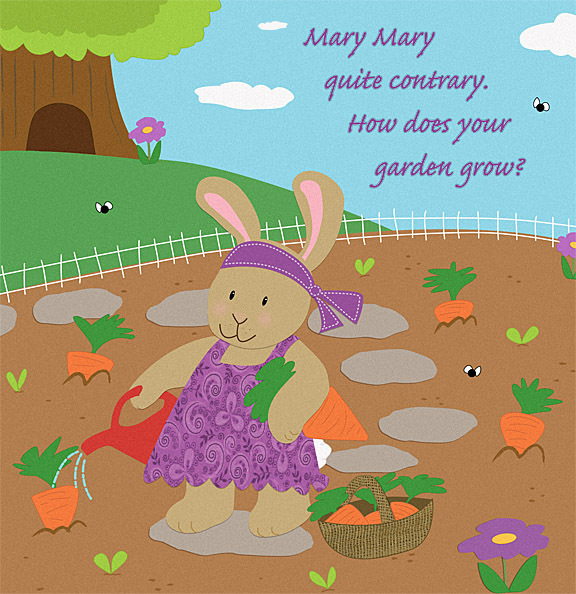 This is the cover page for a 'sing a long e-book' I did a few years ago. It was really fun but was a 'royalty only' set up with www.mightybook.com. It might be different now, I don't know. 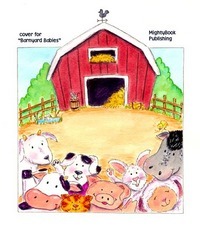 If you are looking to get a publishing credit, may be something to consider. I do actually receive royalty payments but it's just enough to pay for a few art supplies here and there. Still, It was a lot of fun to work on and a very positive experience. Great people. 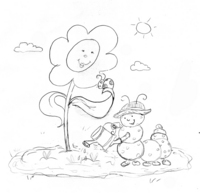 This weeks theme for illustration Friday is "bloom". I don't know if I'll have this done by Friday so I thought I'd share the sketch I'm working on just in case. 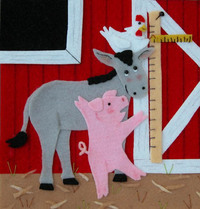 This will be created with felt & embellishments. I need to send a postcard to places that have me on file and this will be the image I use. 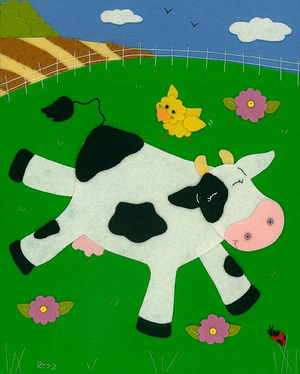 "Felt Like Spring". 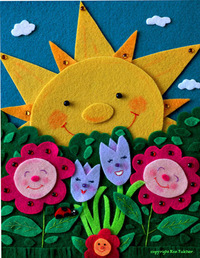 And it sure does feel like spring here today in Texas. Beauteeful! One week, I promise i'm going to take time to create a fresh piece. Not going to happen this week, though, kiddos are home for spring break!
" Ancient lovers believed a kiss would literally unite their souls, because the spirit was said to be carried in one's breath. "~ Eve Glicksman quotes. 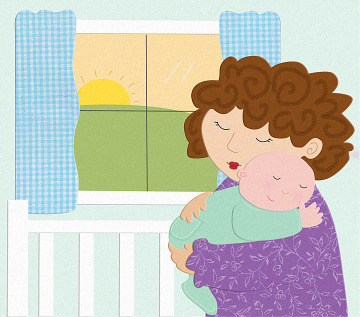 This illustration was done for an online magazine called "Wee Ones" a couple of years ago. It went with a story about a little girl that has allergies and sneezes a lot. 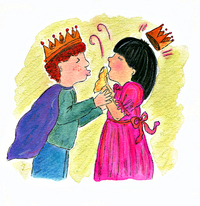 Here, she is supposed to be kissing the prince in the school play. teehee. Hi all, Coming in a bit early with my illo friday again this week. The theme is "jazz". 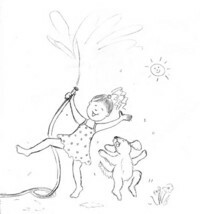 This is another illustration taken from "Luke & Duke", a first grade reader for "Perfection Learning". I had an entirely different image in mind until I came across this quote. I can really identify with this! 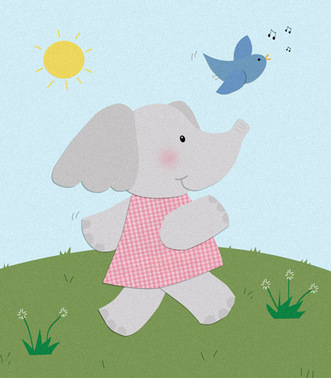 Happy Illo Friday everyone! I didn't realize it until this week that I was born in the year of the rooster. Interesting! 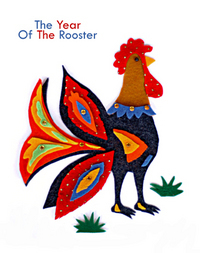 My interpretation of the rooster was inspired by the polish art of paper cutting called wycinanki (vee-chee-non-kee). I love the vibrant colors they use with black customarily used in the background to make the colors pop. 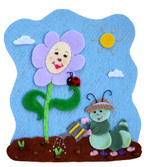 It was a bit tricky trying to create with felt instead of paper but fun nonetheless! "But most of all, Luke liked Duke. And Duke liked Luke!" 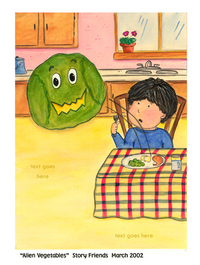 From the book I illustrated for Perfection Learning, "Luke & Duke". It was such a fun story to work on. Okay, I've caved. I had promised myself that I would really wait this time 'til Friday to post my illustration but I didn't. 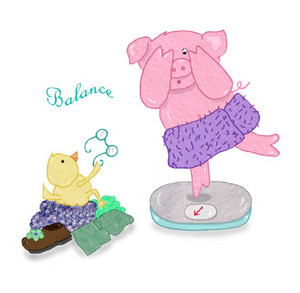 The theme this week is "balance". This one has two meanings. 1) If you balance just right, you just might get it to say the number that you want. 2) Eating balanced meals help, Roz!! CURSE YOU PEANUT BUTTER FUDGE AND EGGNOG. 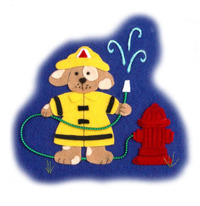 This weeks topic for "illustration friday" Is "disaster relief". I wasn't a bit surprised to see this theme pop up. I think the entire world is devastated by the tsunami disaster. When it came to creating an image though, I'm afraid I took a different route than my fellow illustrators. 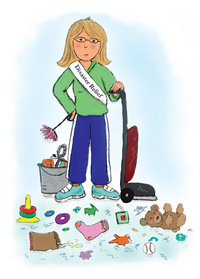 While they created powerful and moving images , I decided on a picture of me cleaning. gulp. Why ? After two weeks of holiday visitors and children being home from school ...the house turned into a disaster area in and of itself. As I pickup , dust, grumble and groan ,I'm reminded of how very fortunate I am to have a home to clean, children to clear up after and a family still alive/safe to come visit. Tragedy does that to you. Illustration Friday is here again and the theme is "magic" I thought I'd show you a piece that I did several years ago that I thought was appropriate. This was created when I first got interested in illustration. I took an on line course by Susan Hartung and this was one of the assignments....to create a magical scene from a story passage she provided. I would highly recommend this class if you are interested in becoming an illustrator. Be warned, she is a tough cookie but boy is she spot on. I learned so much from her and probably the best thing was the experience of having someone evaluate my pieces and critique. That was one of the hardest things for me initially...to show my work and have it judged. The doorway to the hole , definitely didn't read well to her. muddy colors of the hole (yes it's supposed to be a cave) would have been better in blues and purples. Box colors overworked. mass of frogs disappearing into the background , not effective. And the scarf flying out of the box was terrible...looked more like a flying carpet. That tough critique helped me in so many ways, I can't tell you. I hadn't had a "real" assignment from a publisher yet and this really helped prepare me. No matter how wonderful you may think a piece is, there are going to be people that don't. You can't please everyone all of the time and the trick is to detach yourself enough from a piece and remember that you are providing a service. Just recently I finished a book for an educational publisher and the AD drew right over the top of each frog that I had drawn. That was a tough one to swallow but again has helped me grow as an illustrator. ( I still like my froggies better but that's not the point).